China is a massive nation with unique, delicious cuisine in every province, from Shaanxi to Sichuan. While you’re exploring this gorgeous country, whether you’re on business, visiting family, or simply sightseeing during your summer vacation, here are 5 delicious street foods in China that are well worth trying. These delectable dumplings are stuffed with vegetables, meat, or both, and are common street food. Their shape is meant to be evocative of gold ingots, which were a symbol of good fortune. Jiaozi are usually fried and eaten with a dip comprised of soy sauce and vinegar to add more flavor. When you bite into one of these delicious dumplings, your mouth will be filled with delicious, hot broth that is exploding with flavor. While these dumplings can be found all year round, they are especially common around the Chinese New Year. This Sichuan specialty is a hotpot, which has spread like wildfire in popularity. Every region of China now has its own unique variations on the traditional hotpot, which includes various types of meat, soup bases, condiments, and sauces. Like much of Sichuan cooking, the traditional hotpot is packed with fiery, peppery flavor. These Chinese-style kebabs are skewered on small sticks of bamboo and packed with meat and veggies. The meat is often seasoned with salt, dried pepper flakes, and cumin before grilling over a charcoal flame. You’ll see chuan’r quite often during the summer at outdoor evening vendors called dapaidang. With all this salty food, surely there’s something sweet on the street to eat, too, right? Bing tanghulu, or candied hawthorns, are a common street snack in Beijing. The hawthorns are skewered on long sticks after being coated in a simple syrup that’s been allowed to harden. The flavor of these hawthorns is both sour and sweet, and evocative of candied apples. You’ll often find fruits such as apple or strawberry on the skewers with the hawthorns, but the most common variety is filled with hawthorns. Bing tanghulu is a very popular snack due to its sweet, crunchy exterior and soft, sweet, and tangy interior. These deep-fried scallion pancakes are a common breakfast item in China, and rather than use a batter, these pancakes are made with dough. While cooking, the cong you bing are filled with scallions and deep fried. They’re greasy, juicy, satisfying, and a great way to start the day right. 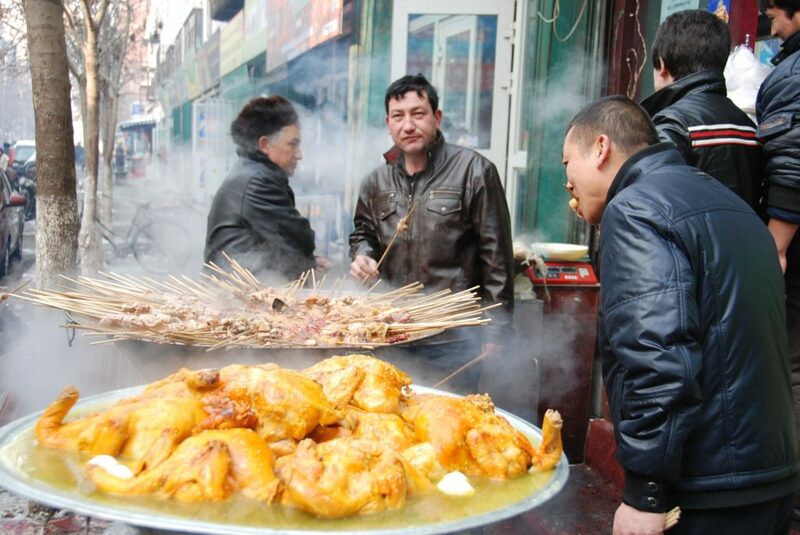 Going to China this summer and eager to sample delectable street foods? You’re going to need a valid US passport and a China visa first, and our experts at Texas Tower Houston can help with that. Call us today at 713-874-1420 to get your China visa.